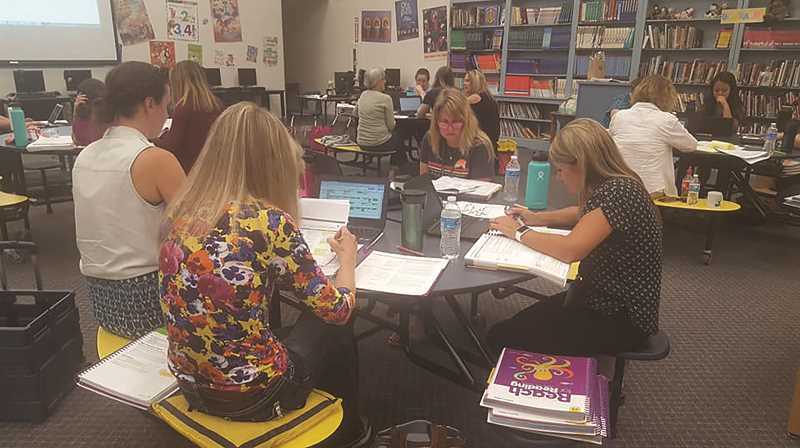 In the Gervais School District, teachers and administrators have been hard at work over the summer in preparation for the coming school year. At Gervais Elementary School, Principal Creighton Helms has taken a page out of the Harry Potter franchise and divided the student body into four houses: Bravery, Friendship, Compassion and Kindness, each with its own color and personalized T-shirt. Every student in the school is assigned to one of the four houses for their entire tenure at GES, and are able to earn tokens for their houses through positive accomplishments. Those tokens can be turned in for various rewards during the course of the school year. Students will sit with their houses during assemblies, rather than with their classrooms, allowing greater comaraderie across age groups in an effort to strengthen natural mentoring opportunities the staff encourages in its older students. "It will provide personal rewards for positive behavior that is based on the principles we want our students to aspire toward, day in and day out," Helms said. Further initiatives at the elementary school this year include the "Free Little Libraries" that were funded through a grant last year and will be installed in September. The small library boxes will be located in front of the school next to newly-installed custom GES benches, and the faculty is encouraging community members to take a book and leave a book at will to recycle new reading material often. The elementary school will also feature new playground equipment for recess this year, including basketball hoops, in-ground tetherball courts and portable soccer goals. Helms expects that a more focused and organized recess program will be more beneficial than unstructured recess time. The school also adopted an English language arts curriculum, focusing heavily on non-fiction material, asking students to explore the real-world implications of the material they're learning. Lastly, the fifth-grade students will platoon across three classrooms this year, similar to the structure at middle and high school levels. Each of the grade's three teachers will focus on a single core discipline: math, reading and writing, and students will rotate between the teachers each day. At the high school level, administrators are excited to promote the continued success of the school's five Career Technical Education strands: construction/technology, agriculture sciences, health occupations, graphic arts and child development. The school focuses on utilizing the CTE programs outside of the classroom. Students in the child development program can apply their education at the school district's on-campus preschool, and those who pursue agriculture sciences are invited to raise livestock throughout the spring to show and sell at the Marion County Fair through the FFA program. Other notable additions to the high school this year include the installation of a new floor in the gymnasium and the addition of Benoit Berho as the school's new Spanish teacher, one of many new faculty additions in the school district this year. Tuesday was the first day of school for sixth- and ninth-graders in the district. Students K-12 started the 2018-19 school year on Wednesday this week.